Oh the fun we’ve had in that wheelbarrow! When our girls were younger, we would set up Friday-afternoon obstacle courses carrying kids around orange cones to see who could cross the finish line in record time. Many compliant puppies took trips in that wheelbarrow along with kittens who looked like they were skydiving for safety. I’ve hauled pumpkin-patch pumpkins from the car to the front porch in that wheelbarrow only to haul the same decorative pumpkins to the woods to disintegrate into mother earth six weeks later. We’ve carried loads of landscape rock and piles of bush trimmings in that one-wheeled contraption. We’ve drug Christmas decorations from the pole barn to the front yard through inches of snow with the help of that wheelbarrow and then again through the fresh grass carrying spring flowers, potting soil and mulch. It’s really a jack-of-all-trades type of U-Haul® device. At our house, nothing was off limits with the wheelbarrow. Even when rusty, it was dependable to carry the weight on one wheel that we couldn’t carry alone. Jesus wants to be the wheelbarrow in our lives. He wants to carry us through the tough times, race with us through the fun times and be the One to carry all the load to make our burden lighter. Matthew 11:28 – Come to me, all you who are weary and burdened and I will give you rest. 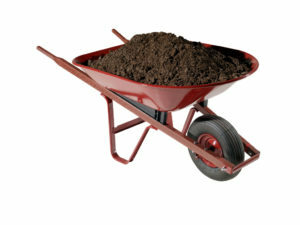 What’s in YOUR wheelbarrow? Is it getting too top-heavy and awkward? Whatever it is, give it to Jesus. Let Him do the heavy pushing. He wants to help. Just let go and let Him take over. No load is too heavy for the Carpenter. This entry was posted in devotional, inspirational, motivational, spiritual on September 25, 2018 by Deanna Young. Thank you for the reminder that Jesus can carry all of our burdens — no matter how heavy — any distance.